Rembrandt was born in Leiden on July 15, 1606 - his full name Rembrandt Harmenszoon van Rijn. He was the son of a miller. Despite the fact that he came from a family of relatively modest means, his parents took great care with his education. Rembrandt began his studies at the Latin School, and at the age of 14 he was enrolled at the University of Leiden. The program did not interest him, and he soon left to study art - first with a local master, Jacob van Swanenburch, and then, in Amsterdam, with Pieter Lastman, known for his historical paintings. After six months, having mastered everything he had been taught, Rembrandt returned to Leiden, where he was soon so highly regarded that although barely 22 years old, he took his first pupils. One of his students was the famous artist Gerrit Dou. Rembrandt moved to Amsterdam in 1631; his marriage in 1634 to Saskia van Uylenburgh, the cousin of a successful art dealer, enhanced his career, bringing him in contact with wealthy patrons who eagerly commissioned portraits. An exceptionally fine example from this period is the Portrait of Nicolaes Ruts (1631, Frick Collection, New York City). In addition, Rembrandt's mythological and religious works were much in demand, and he painted numerous dramatic masterpieces such as The Blinding of Samson (1636, Städelsches Kunstinstitut, Frankfurt). Because of his renown as a teacher, his studio was filled with pupils, some of whom (such as Carel Fabritius) were already trained artists. In the 20th century, scholars have reattributed a number of his paintings to his associates; attributing and identifying Rembrandt's works is an active area of art scholarship. Rembrandt produced many of his works in this fashionable town house in Amsterdam (above left). Purchased by the artist in 1639, when he was 33, it proved to be the scene of personal tragedy: his wife and three of his children died here. The house became a financial burden, and in 1660 Rembrandt was forced to move. A new owner added the upper story and roof, giving it the appearance it still bears. In 1911 the Dutch movement made it a Rembrandt museum -preserving it both as a shrine of a revered national artist and as an imposing example of 17th Century Dutch architecture. In contrast to his successful public career, however, Rembrandt's family life was marked by misfortune. Between 1635 and 1641 Saskia gave birth to four children, but only the last, Titus, survived; her own death came in 1642- at the age of 30. Hendrickje Stoffels, engaged as his housekeeper about 1649, eventually became his common-law wife and was the model for many of his pictures. Despite Rembrandt's financial success as an artist, teacher, and art dealer, his penchant for ostentatious living forced him to declare bankruptcy in 1656. An inventory of his collection of art and antiquities, taken before an auction to pay his debts, showed the breadth of Rembrandt's interests: ancient sculpture, Flemish and Italian Renaissance paintings, Far Eastern art, contemporary Dutch works, weapons, and armor. Unfortunately, the results of the auction - including the sale of his house - were disappointing. These problems in no way affected Rembrandt's work; if anything, his artistry increased. Some of the great paintings from this period are The Jewish Bride (1665), The Syndics of the Cloth Guild (1661, Rijksmuseum, Amsterdam), Bathsheba (1654, Louvre, Paris), Jacob Blessing the Sons of Joseph (1656, Staatliche Gemäldegalerie, Kassel, Germany), and a self-portrait (1658, Frick Collection). His personal life, however, continued to be marred by sorrow. His beloved Hendrickje died in 1663, and his son, Titus, in 1668- only 27 years of age. Eleven months later, on October 4, 1669, Rembrandt died in Amsterdam. Rembrandt's parents marry in the reformed Pieterskerk in Leiden. Rembrandt's fater, Gerritsz van Rijn (the river Rijn)was the only member of his family who converted from Catholicism to Protestantism (after 1630). Rembrandt's mother, Neeltgen Willemsdr. van Zuytbrouck, was the daughter of a baker (after 1640). Rembrandt's parents had 10 children , two died in infancy. Rembrandt was the 8th child. In 1640, 4 children were still living: a shoemaker, a baker, Rembrandt, and a daughter. Rembrandt van Rijn attends the Latin School to prepare for admission to Leiden University. Enrolls in the University (2 months before his 14th birthday). Already attending Latin school. The school trained their students in grammar and rhetoric. Lessons were based on classical literature. Rembrandt received a thorough grounding in classical and biblical stories. In 1625 the States of Holland standardized the curriculum. Possibly, there were political reasons for not pursuing an academic career; there are other reasons as well, such as obtaining student privileges, freedom from civic guard duties and a specified allowance of tax-free wine and beer. Rembrandt is apprenticed to Jacob Isaacszoon van Swanenburgh (1571-1638). Van Swanenburgh was a Catholic, his father was burgomaster 5 times and held other major town offices. The rest of the family was Remonstrant. They were removed from civil office by prince Maurits in 1618. Swanenburgh had been in Italy from about 1600 to 1617. Van Swanenburgh painted in Venice, Rome and Naples. He married a Neapolitan woman. A few fantasies have been preserved but none of his portraits and cityscapes. There are no discernible traces of his influences in Rembrandt's oeuvre. That Rembrandt studied with Van Swanenburgh is known from a biography written by the Leiden burgomaster in the 2nd edition of his description of Leiden. Rembrandt studied with him for about 3 years. A document of 18 October 1622 shows that Rembrandt is still living with his parents in Leiden's Weddesteeg, together with his brothers and sisters Gerrit, Machtelt, Cornelis and Lysbeth. His brothers Willem and Adriaen have left home. Rembrandt spends 6 months with Pieter Lastman in Amsterdam. According to Houbraken, Rembrandt also studied with Jan Pynas. History, rhetorical gestures, historical veracity, textual accuracy were important lessons in their studios. Rembrandt sets up as an independent painter in Leiden, living at home with his parents. The Stoning of Stepen is Rembrandt's earliest dated painting. In this picture, as well as in other undated history paintings from his early career, Rembrandt gives a spectator his own features. On 14 February, the 14-year-old Gerrit Dou becomes Rembrandt's first pupil. Rembrandt makes two etchings of an old woman, probably his mother, as well as several undated self portraits. Rembrandt completes a painted self portrait his earliest dated picture of himself. The same year he signs and dates an etched self portrait. After his stay in the northern Netherlands in this year, Ambassador Sir Robert Kerr (1578-1654), later the first Earl of Ancrum, gives several paintings to King Charles I, among them 'the picture done by Rembrant, being his own picture & done by himself'. An Amsterdam inventory of 19 October lists a painting (no longer identifiable) as 'a small tronie (head) by Rembrandt'. Gerrit Dou and Isaac Jouderville work with Rembrandt as his pupils. Constantijn Huygens (1596-1687), secretary to Stadholder Frederick Henry, visits the Leiden studio shared by Rembrandt and Jan Lievens (1607-74), and compares their work. He finds them both brilliant, but too introverted. Not long afterwards, Huygens procures Rembrandt important commissions from the court in The Hague. Rembrandt marries Saskia Uylenburgh (1612-1642) in Friesland. She is the cousin of Rembrandt's landlord and the daughter of the late burgomaster of Leeuwarden. They live in the house of H. Uylenburgh. Rembrandt becomes an Amsterdam citizen and joins the local St Luke's guild. Rembrandt moves into his own quarters. 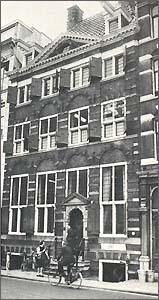 Moves again in 1637 into the "Rembrandt house" in the Anthonisbreestraat. Saskia dies; Rembrandt employs Geertje Dircks as nanny for son Titus, born 1641. (4 children, 3 died) Rembrandt begins relationship with Geertje Dircks, the trumpeter's widow. Hendrickje Stoffels joins household as maidservant. Rembrandt transfers his house to his son Titus in order to save his inheritance. The liquidaton of Rembrandt's property. Inventory of goods taken. Rembrandt couldn't remarry because he would risk losing income from Saskia's estate. (Reason given was "losses in business as well as damage and losses at sea." Explained variously. 1) he invested in cargo that was lost at sea, 2) his pictures were lost at sea. Rembrandt leaves St. Anthonisbreestraat, moves to the Rozengracht area. Many other artists living in that area. In May, Rembrandt, Hendrickje, Titus and Cornelia move to a rented house in Rozengracht (now no. 184) in the Jordaan district of Amsterdam, opposite the Nieuwe Doolhof (the maze). Rembrandt paints himself seated in state like a monarch. In an etched self portrait of 1658 we see the artist at work as an etcher. It is his last self portrait in this medium. On 15 December, Hendrickje and Titus transfer the company and trade in paintings, graphic art, engravings and woodcuts'to their names, thus relieving Rembrandt of all financial control. He can continue to paint, but must leave business matters to them. Titus becomes universal heir. A document drawn up on 20 0ctober calls Hendrickje 'the wife of Mr. Rembrandt van Rijn, art painter', although they have not married. The biographer Cornelis de Bie (1627-after 1711) praises not only Rembrandt's paintings 'which enlighten every mind', but also his etchings:'It is the very soul of life that lives therein'. Rembrandt paints himself as the apostle Paul. He paints The Sampling Officials of the Amsterdam Drapers'Guild (Amsterdam, Rijksmuseum), and receives major commissions for portraits and other works, some from the extremely wealthy Trip family. Hendrickje Stoffels dies and is buried in a rented grave in Amsterdam's Westerkerkon July 24, probably a victim of the plague. The painter Christiaen Dusart (1618-82) is appointed guardian of Cornelia van Rijn on 21 July. Her father, Rembrandt, is described as 'hale and hearty, 'in full use of his mind, memory and speech'. The learned Swiss monk, Gabriel Bucelimis (1599-1681), notes in his diary that Rembrandt is 'the miracle of our age (Rimprant, nostrae aetatis miraculum)'. On 19 June, Titus van Rijn applies for and is awarded veniam aetatis (legal maturity). On 29 December, Cosmic, de'Medici (1642-1723) calls on Rembrandt, who is described as 'pittore famoso (famous painter)' in his travel journal. It later transpires that the Italian Grand Duke owns one of the painter's self portraits. Titus marries Magdalena van Loo, daughter of a silversmith, but Titus dies soon after, buried in the Westerkerk in Amstedam. Titia van Rijn, Rembrandt's granddaughter and goddaughter, is baptised in the Nieuwezijds Chapel on 22 March, six months after the death of her father Titus. Rembrandt paints three self portraits in the last year of his life. On 2 October, Rembrandt is visited by the amateur genealogist Pieter van Brederode (1631-97), who makes a record of antiquities and curios in his collection. Rembrandt's granddaughter is baptized. October 4, Rembrandt dies and is buried in the Westerkerk in an unknown rented grave.